Coming-of-age or becoming someone else? We've selected three very different books today - but they are connected in two important ways: they all feature brilliantly realised (though totally different) main characters on a profound journey of change...and they are all books that we have loved. 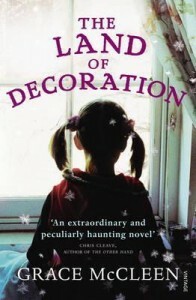 In 'Land of Decoration' by Grace McCleen, ten year old Judith McPherson lives with her father. They belong to a devoutly religious group who tour the local area, searching for souls to save rather like door-to-door salesmen trying to sell Armageddon. Judith’s life might be narrow and confining – full of Necessary Things, like pondering God’s will, eating bitter greens and being the grateful object of the congregation’s knitting enthusiasts. But Judith lives in a land of her imagination and constantly combs the ground for scraps of rubbish she can take home and craft into the Land of Decoration, which fills her room at home as well as her mind. But when bullying at school reaches worrying levels, Judith begins a dialogue with God, asking God why he doesn't do anything about it - with unexpected consequences when God appears to step in leading Judith to believe she is responsible for a miracle that saves her. At first she feels she is gaining control of events and her life. Even a new teacher, Mrs Pierce, seems to signal that her life is about to turn around. But no actions are without consequences. Quickly events spiral beyond her. After all, if you step in to save one person, who else might be affected? As God says to her, in an increasingly bitter dialogue, who would want to be God? Full of philosophical questioning, full of remarkable insights and description. We are drawn into Judith’s world – a world in which she is never judgemental, yet she has such perceptive eyes we are able to see exactly the terrible poverty that surrounds her and the deep grief of her father. But also her intelligence and humour and mental strength all shine through, making for an emotionally satisfying novel. This was our first book group choice of the year and one that received a rare universal thumbs up. Not an easy read, but at the same time manages to be utterly engrossing and satisfying and absolutely brilliant. Often with debut authors you don’t expect to discover such a well-crafted and well-rounded novel with such a freshness that is maintained throughout. A well-depicted world with believable characters and a gripping sense of crisis growing and is compelling in the way it can move from humour to disaster in a moment. Author Grace McCleen, despite having been selected by several prizes for debut authors says this will be her one and only book. Apparently heavily autobiographical, it might be difficult for her to repeat this feat. But we all hope she changes her mind and does another. 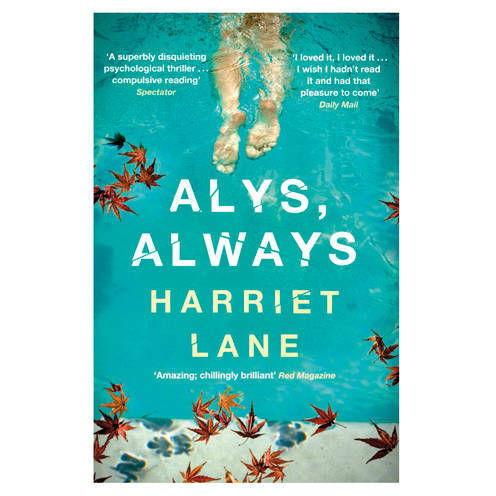 Frances Thorpe on the other hand is a whole different character in the gripping psychological thriller 'Alys Always' by Harriet Lane. "This is a gripping, slim read with a really intriguing character. At first Frances appears boring and vulnerable but changes before our eyes and shows just how resourceful she really is. 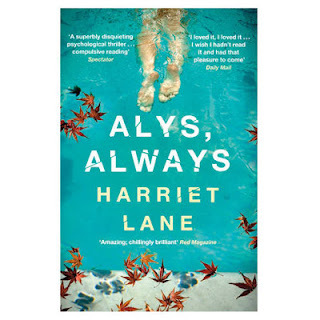 The writing is spot on and Harriet Lane is perfect at knowing what to leave out and how to tantalise. Suspenseful and utterly believable, with a slight chilling undertone, this is a fantastic read that reels the reader in." 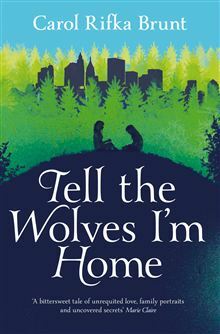 Finally, one of Nicki's favourite books from last year - Carol Rifka Brunt's 'Tell the Wolves I'm Home' - is new out in paperback. When June’s uncle, a renowned painter, dies, she isn’t prepared for all the family secrets that begin to emerge in this really engrossing, emotional coming-of-age tale. The small intricacies of growing up are beautifully invoked in this story of love and loss and how finding that simple closeness you shared as children doesn’t always come easy when you leave childhood behind. A fantastic debut that adults or teens might enjoy.